China’s Belt and Road Initiative (BRI) plays a crucial role in connecting China to Cambodia and enhancing connectivity and cross-border trade within Asia and across the globe, the Minister of Public Works and Transport said Friday. 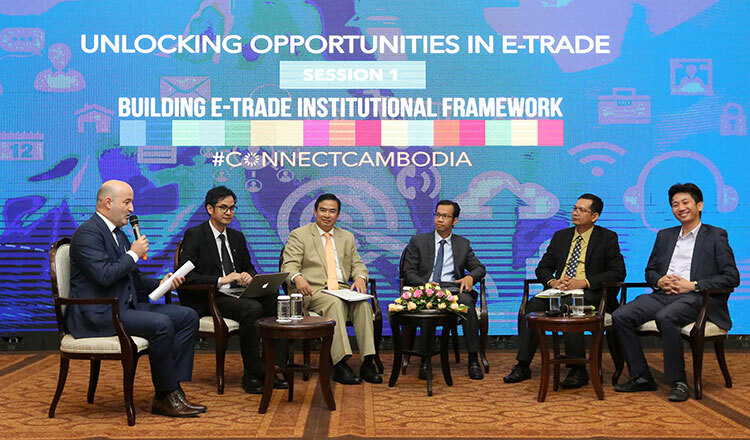 Speaking at a forum on the BRI and e-trade held in Phnom Penh, Transport Minister Sun Chanthol said the mammoth China-led project will boost trade between Cambodia and countries across the world by improving transportation infrastructure. Proposed by Chinese President Xi Jinping in 2013, the Belt and Road Initiative – also known as the ‘One Belt One Road’ initiative – is an effort to create a China-centred trade and infrastructure network spanning Asia, Europe and Africa along the ancient routes of the Silk Road. “The BRI will bring benefits to every country included, and it has the potential to connect the whole world,” Mr Chanthol said during his speech. As an example of the importance the current administration places on improving connectivity, Mr Chanthol mentioned the recent creation of the National Logistics Council, which he said has been designed to “take a holistic view of the impediments” in the sector, and reduce costs associated with logistics. The goal of the body, according to the minister, is to make export logistics more efficient. Mr Chanthol said his government has made it a priority to make the logistics sectors “more competitive, efficient, transparent and affordable” to push the development of electronic commerce in the Kingdom. Addressing the same audience at Friday’s event, Pauline Tamesis, resident representative at the United Nations Development Programme, said the BRI has created new development opportunities to advance cross-border trade in Cambodia. She described the project as an ambitious effort to improve regional cooperation and connectivity “on a trans-continental scale,” and explained that more than 100 countries are already involved in the Silk Road-inspired undertaking. “Through the One Belt One Road Initiative, e-commerce and e-trade could support productive activities, decent job creation, entrepreneurship, creativity and innovation, and encourage the formalisation and growth of small and medium sized enterprises,” Ms Tamesis said. Meanwhile, Steven Li, vice president of Shenzhen 4PX Express, part of the Alibaba Cainiao Logistic Group, said the Kingdom’s underdeveloped logistics infrastructure remains a hurdle in efforts to boost trade and connectivity with China. “I think Cambodia is now connected to the BRI, but, in terms of the logistic infrastructure, the country is still not ready. “Cambodia needs to work hard on developing this infrastructure to facilitate e-commerce between China and Southeast Asian countries. This will allow us to import a lot from these countries which will generate jobs here,” Mr Li added.